Both by student population and by sheer acreage, my high school was the size of a community college. Logan was huge. Say what you want about every student being a little fish in a huge pond, but we had a lot of after school programs. I feel like what you were involved in after school defined who you were. I did swimming and water polo. Dustin played golf. Tommy did forensics. My sister was in drama. Andrew played baseball. Janou played basketball. Lili did whatever the leadership kids were doing at the time. But because Logan was so sprawling, it could accommodate loads of students doing all sorts of things. My school here is much smaller (by a factor of about 6), and likewise, the campus is much smaller. That said, the after school opportunities are impressive. The school fields at least two levels of rugby teams and, I think, 3 netball teams. Have we not talked about netball? 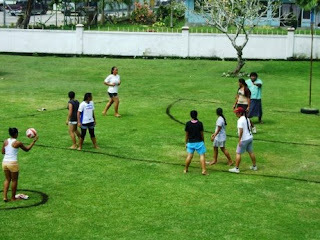 Netball is a strange sport that they play in the south pacific. 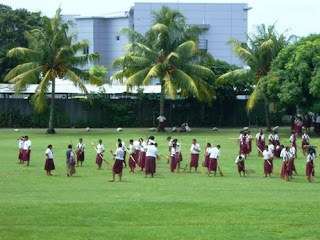 I had certainly never heard of it before arriving in Samoa, but it is kind of a huge deal here. 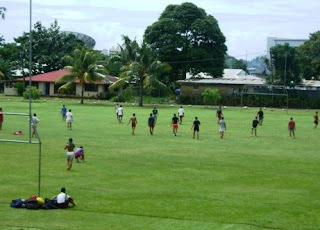 It’s a girls-only sport that’s played barefoot on a grass field with lines similar to a basketball court. The object of the game is to get the ball into the hoop, but there’s no backboard. And if someone goes to take a shot, no one can’t do anything to stop her. I’d assume there must be some good stuff on YouTube. I find it fascinating. In any case, with sports starting up, I was sure attendance would dwindle in my after school computer lab hours, but it’s standing room only again today. The room seems evenly split between underclassmen playing Mavis Beacon and the year 13 students working on Internal Assessments for other classes. Internal Assessments are projects that make up the framework that determines ranking for all year 13 students across the South Pacific. My principal has suggested that I keep a list of the students who come after school so we can submit that list and get $20 added to their tuition to pay for computer-related maintenance. This doesn’t sound like it would encourage use of the computer lab, and I am hesitant to implement this policy. On the other hand, I am downright excited to charge students to use the Xeroxing capabilities of the MFP that I have here in the lab (50 sene per page). I haven’t figured out how to disallow students from printing from their computers (aside from removing the driver, which I don’t really want to do). It seems like it should be easy enough to find in the group policy management in Windows Server, but I’ve been trying to solve the issue for a month now. Anyone have any ideas? Ideally, I’d like their print jobs to queue up on my computer, and then I would be able to hand pick which ones actually get sent to the printer. We were told in training that there wasn’t much in the way of vibrant after school programs in Samoa because of the difficulties that transportation presents. 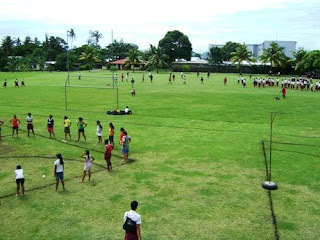 But I think the plethora of buses in Apia allows students to stick around and pursue activities that they normally wouldn’t be able to in more rural places. I hope you’re also exploring your extra-curricular interests. Pictures below. Warning! The last picture is particularly macabre. Update! I went rowing with Jordan tonight, and it was really fun. I didn't take my camera on account of wanting to keep my camera alive. But I think I'm going to go again next Wednesday, so I'll just blog about it then. Detention raking the grass... chain gang style. I went to make dinner last night, and, oh! Dead lizard on the floor covered in ants. Who's hungry? 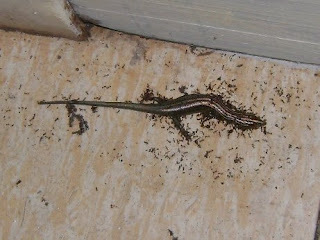 that lizard is in a very odd position. looks like a crime scene. i feel bad since you already have such an ant dilemma.